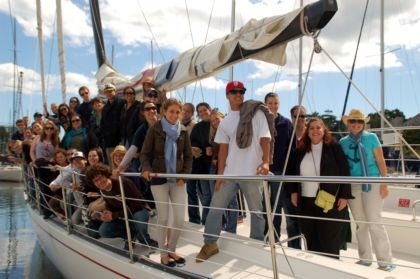 In May 2011, The Chardonnay II Sailing Company graciously donated a private charter to honor the dedicated teachers and instructors at The Bay School. After the students were dismissed the team headed to the Santa Cruz Harbor and boarded the 70-foot yacht, which then led a two-hour tour of the Monterey Bay National Marine Sanctuary. The Bay School extends a big thank you to the Chardonnay II for an extremely generous donation and a very memorable afternoon! Learn more about the Chardonnay II Sailing Company here.